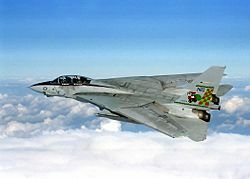 An F-14A Tomcat from the USS Nimitz (CVN-68) during the Operation Southern Watch in 1997. An air superiority fighter is a fighter airplane, which is designed for close combat in the air against enemy fighters. This type of aircraft is very expensive and it is produced in smaller numbers than other types of fighters. Fighters designed for fighting beyond visual range of pilot. This kind of fighters are called interceptors. This kind of fighter has no forward gun and it does not have any good maneuverability, because it is not supposed to fight with enemy fighters in a close distance, but this kind of fighter has long range air-to-air missile and a very strong radar. Fighters designed for fighting within visual range. This kind of fighters are called air superiority fighters. This kind of fighter has weapons like guns and short range missiles for close combat. this kind of fighter has a very good maneuverability. Air superiority fighter Facts for Kids. Kiddle Encyclopedia.